The Greenway is a 2,200 acre, open, natural space along the Red & Red Lake Rivers in Grand Forks, ND and East Grand Forks, MN. Greenway Trail ND/MN Grand Forks. Access to the Greenway trail is available along the system through several access points. Please consult our map at www.greenwayggf.com for more details. The development of this trail along the Red and Red Lake Rivers was a result of the massive flooding that occurred in this community in 1997. 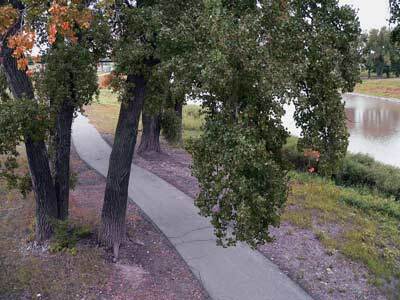 To ensure that Greater Grand Forks would be protected against future flooding, the US Army Corps of Engineers proposed the construction of a flood protection system including a Greenway, along the Red and Red Lake Rivers. The trail was developed as a part of this recreational component to the Flood Protection Project. The Greenway provides a unique opportunity for year-round outdoor recreation activities in an urban setting. Encompassing approximately 2,200 acres of natural open space in the heart of Grand Forks, ND and East Grand Forks, MN, the area is an outdoor enthusiast's dream. Several parks, campground, golf courses, disc golf course, trails, shore bank fishing sites, and plenty of winter activities provide a year round recreation opportunities. Trail users will notice a distinct difference between this trail and other urban trails: limited contact with vehicles. Vehicle trail crossing are very limited within the system. This feature allows for long stretches of unrestricted recreational use. The Greenway also offers trail users access to more than 43 miles of bicycle trails that wind throughout the two cities. Cyclists looking for a challenge can also access The Rural Bicycle Loop, a 100-mile paved route beginning and ending in Grand Forks. The trail is managed by four separate agencies located in two cities in two states. A technical committee has been developed and provides representation of all managing agencies to address technical issues with the trail and greenway. This committee pools financial resources to develop communication tools about the greenway trail system. Committee representatives also work together to manage the area surrounding the trail system. One example is two managing agencies sharing equipment to groom cross country ski trails. Other representatives on the committee include local and state government, health facilities, media, state park, recreational agencies and users. Meetings are held on a bi-monthly basis. The location of the Greenway provides the perfect setting for learning. A series of interpretive plaques highlighting the history, wildlife and geology of the Greater Grand Forks area are located throughout the trail system. A wide variety of plant species grow throughout the Greenway system. Visitors can also experience many types of animal species in their natural habitat along the trail. The Red and Red Lake Rivers run through the entire Greenway and provide the perfect opportunity to view many different species of birds in their natural habitat. Located in the Central Flyway the Greenway is a great place to view migratory or resident birds. Although hundreds of homes in established neighborhoods were demolished to make way for the flood protection system, this provided the opportunity to develop a continuous trail and recreation project in areas that were not available prior to the flood. Until that time, private property along the river and the density of city blocks did not allow for development of green space within the older neighborhoods. Now residents along the greenway have access to the largest trail and park system in our communities right outside their door. Grand Forks, ND and East Grand Forks, MN boast a population of approximately 60,000. The communities serve as a regional hub to over 90,000 of residents within a five county area providing shopping, entertainment and recreational opportunities. Access to the greenway is free, though some special events may require a fee for participation. A wildflower and sculpture garden commemorates the site of one of the oldest neighborhoods in Grand Forks. This area was vacated to make way for the Greenway. The garden was designed and funded by former residents of the Lincoln Drive area and features wildflowers native to the area. Benches strategically placed around the garden provide views of the garden and sculptures in a natural setting. Many health and fitness organizations are involved in the Greenway, particularly in the hosting of public walks, runs and rides to promote fitness using the trails. One example of an agency promoting the trails is the 5+5 Coalition was formed to encourage healthy eating habits and physical activity of the cities of Grand Forks, ND and East Grand Forks, MN. The Coalition's mission is "Promoting Healthier Lifestyles," and has been promoting events being held on the greenway trails. Other health organizations include the YMCA, Center Court Fitness, and Altru Health Systems. A labyrinth is located in the Greenway and provides the opportunity to quiet the mind, find balance, and encourage meditation, insight, and celebration.